I am curious (because I am receiving my GMT II - z series Red/Black this Friday) if anyone else has come across or heard of this before. I wonder if mine has the 3186 movement? It's a Z serial. Find More Posts by Felly Jr.
open her up and see! Yes, only one way to find out! Go back to your AD, 'cos that Pepsi is quite new right Felly??... and get them to open it up for a look!! I'd want to see the RSC paperwork before I believe it. Seeing a 6 when looking at a 5 is not a hard thing to do. I think I'll wait until I get the call for my Daytona or Milgauss and then possibly have them take a peek see. I have to drive almost 2 hours to get there so it would be better to kill two birds with one stone. Err buddies...very interesting indeed...then does it mean that the Z series 16570 Explorer II which basically has the same movement as the 16710 GMT Master...may also have the NEW 3186 movement with Parachrom spring...???????? Wow this is interesting to hear at the least!!! Something I never expected. Maybe Rolex installed the 3186 on the older style GMT II's as a way of experimenting/testing the new movement before using it on the GMT II-C. Does this mean that the older style Z serial GMT II's (16710) models with the caliber 3186 movement are some kind of "transitional" models? It is an interesting thought! I'm surprised that the RSC watchmaker was surprised. They should know what's going on. The watchmaker may see wrongly. 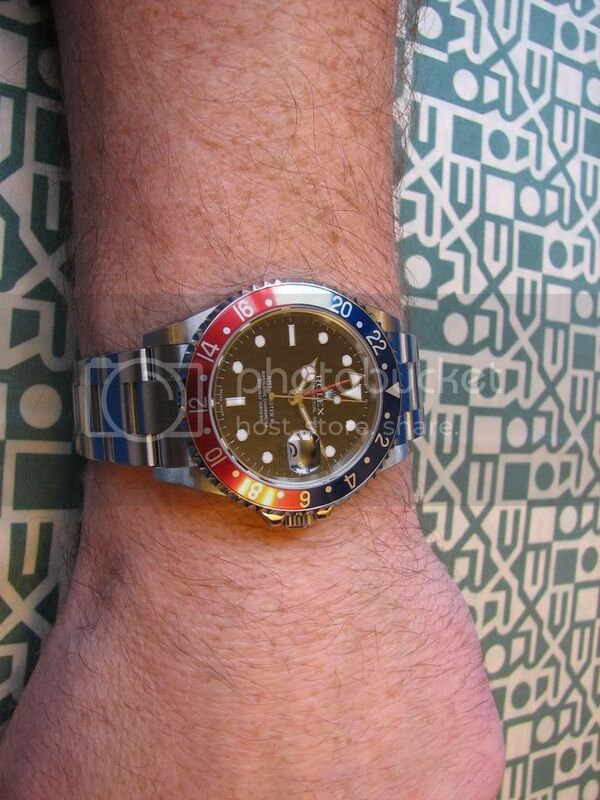 It maybe another rolex rumour. 2. maybe rolex had so many cases for GMT's and ran out of movements and just started inserting these movements in besides making older movement while in the process of making new movements ! The person from Finland on the other forum has 14 posts. Why does this have any credibility? I mean, you can't even get a bezel change on a particular model, having a different caliber would be even less likely. Putting the in-house hairspring in an older caliber I can see. The half a millimeter larger size of the 3186 though, when inside a case, makes a difference. Seriously, if this was true it would be documented. It was my first Rolex, and now I'm in LOVE! You will be able to tell easily without removing the back... Find another 16710 at an AD, and try setting the hands. If there is more play on setting the hands than on your Z series, then maybe, perhaps, possibly, there is a 3186 movement in there. There is a noticeable difference between the amount of play in the hands between both watches. The 3186 movement has the gears closer together removing a lot of this slack. So are you talking about the responsiveness in the hands when you turn the crown to set them, like play in the steering wheel of a car? I share Paulies skepticism on this..
Where's Mythbusters when you need them ????? I believe they are currently working on the "It takes 14 months to produce one Rolex watch" myth. Can`t say I have ever seen a 3186 in a 16710, in fact yesterday I had a Z serial 16710 to work on and it had a 3185 in it. SS GMTII ceramic was launched. It would be logical to asume that any 16570`s produced after that date would have 3186 movements in them. So we are more likely to see the new movement in an EXP II than a GMT ?? Wouldn't/shouldn't Rolex have changed the ref # to 116570 due to a new movement ??? Well its true it is a small world after all. I had a phone call from a watchmaker friend in Finland this morning. It turns out he was the watchmaker who worked on the 16710 in the thread. He confirmed it was definatley a 3186. I guess that any 16710 cases left without movements when production of the 3185 ceased had 3186 movements fitted. Guess they`d be pretty rare. what movement is in the Explorer II? From avaliable information, it would appear that any 16570 EXP II produced after April 2007 and with the ingraved reflector ring around the dial edge should have a 3186 movement fitted. Phew! How's that for news!